The Kinesiology tape is designed to improve the bodies natural healing process by increasing bloodflow around the muscle. It's non-restrictive and applied over the muscle to reduce tension, pain and inflammation. It relaxes overused and tired muscles and supports muscles in motion. Its self-adhesive wave pattern allows for un-restrictive motion and moves with the skin and muscles. 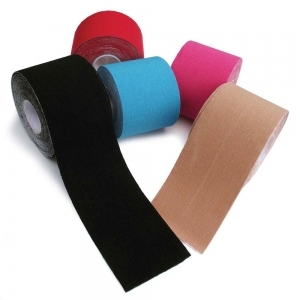 The tape is water-resistant, breathable and may be worn for a number of days. Kinesiology - The study of bodily kinetics. This products seeks to advance the bodies natural healing system by mimicking the skin, encouraging better bloodflow and allowing the muscles to flex freer but with more adequate support.